Did you know that squid and calamari are different? A while back I was in a restaurant and wanted to order a calamari appetizer. I half-jokingly asked the waitress if it was really squid. She surprised me with “No, it is calamari.” I did a little searching and discovered something interesting. So what is the difference between squid and calamari? …..about $5 a pound. Many people, including me until recently, think squid and calamari are the same. Actually squid and calamari are two different species. They are cephalopods of the order teuthida and there are well over 300 different species. Squid is cheaper and tougher while calamari is more tender and expensive. Squid is usually Nototodarus gouldi, Gould’s squid, or Teuthoidea. Calamari come from the genus Sepioteuthis. 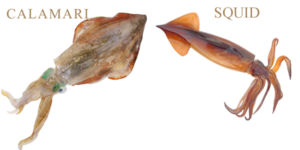 You can tell squid from calamari by the fins that form an arrow shape on the end of the hood. Squids have fins, but these run only for a short distance on the sides of the body. The fins of calamari extend almost all the way down the hood. When you see both, you can make out the difference easily. See the photographs above. Some people even think that calamari is just the Italian word for squid, or that squid refers to the creature and calamari refers to the cooked item. Perhaps the difference in the name used might be because calamari sounds more palatable than squid. In some restaurants the term calamari refers to Mediterranean dishes made from squid. In some parts of the world, baby squid used for cooking are known by the name calamari. ……and I’m sure that is much more than you wanted to know. This entry was posted on Tuesday, June 7th, 2016 at 4:27 pm	and is filed under Chemistry. You can follow any responses to this entry through the RSS 2.0 feed. Both comments and pings are currently closed.